Movement artist, healing adornment designer, and energy healer Aaron-Raheim White explores the power and mystery of their crown in a new work for CabinFever Presents, "Kueen's Qrown" 💎👑🎉✨. Please enjoy photos, a video, and musings by this enchanting artist. Since childhood, I have been extremely sensitive to others’ energies and it has been a complicated, sometimes tumultuous, journey in learning how to navigate those feeling/impressions/intuitions. But three years ago, after taking a Kundalini Yoga class and wrapping my head in white for the first time, I experienced the power of protection it provided. My relationship to my crown [chakra] has developed, morphed, and shifted many times since. Fast forward to July 2018, I’ve experienced an exponential expansion in my relationship to my crown. The crown chakra is our connection to the Divine and is associated with the transcendence of our limitations, whether they are personal or bound to space and time. Some describe this chakra as the gateway to the cosmic self or the divine self, to universal consciousness. Therefore, in my mind, it makes sense that, when the crown is covered, it acts as a filter to other energies since this is the energy port that connects us to the ALL. The beginning of the month found me on the campus of the University of Illinois at Urbana-Champaign. I communed with nature and with the solitude of my mind. It was the first time in years that I felt I NEEDED to be outside, beyond my immediate space, i.e. in my building or courtyard, without my head covered! I obliged and the feeling of liberation was uncanny and profound. However, interacting with others was still a challenge as I could still feel their misaligned vibrations. I re-discovered how important it is to allow my crown to breathe in nature and soak up the sun – honoring its own experience. Next trip was New York City- full of color, uniqueness, various genders and gender embodiments, which made me feel right at home. I was constantly inspired by the artistic/stylistic expressions of New Yorkers. The uninhibited were my favorite as they reminded me of the power of one’s uniqueness. They had to do nothing but be themselves and I echoed this reflection. I was not comfortable enough to parade the city headwrap-free as I was already overstimulated. However, I received exactly what I needed as NYC reminded me to be grateful of the path I have taken to get to where I am today – my embodied Kueendom. My previous life in NYC was PERFECT as it pushed to move back to Chicago in search of who I truly was/am. By the end of the month, I was back home in Chicago feeling a newfound confidence and ease. 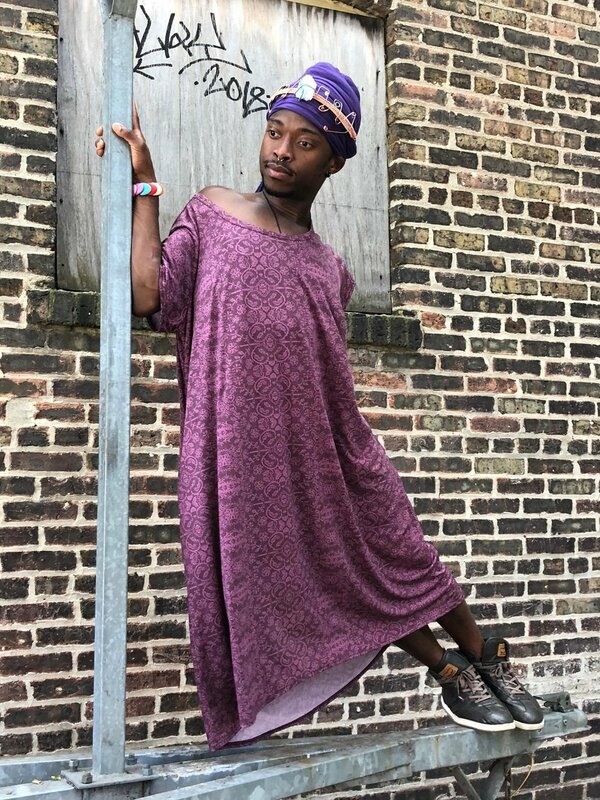 I felt my Kueendom, which was not chaotic, not flustered, not trying to impress, not worried about others’ thoughts and ideas about my expression, shift into just good ole’ fashioned “loving me for me.” With this clarity, I wanted to capitalize and anchor these energies in a crowned adornment. The Kueen’s Qrown encourages a clear mental state and physicalizes my sense of regality. It Is also unashamed and knows it’s power. She (the Kueen’s Qrown) is adorned with a celestite center piece and smaller, fluorite, garnet, goldstone, and hematite selections – all held together with copper wire. All stones hold a particular vibration, resonating with various qualities and I was clear about what they needed to be. Celestite can be used in assisting one’s analytic capabilities in regards to complex ideas, stabilizing yin-yang energies in one’s energy field, promote a pleasant disposition, and provide fluency in communication – especially when accessing information from the angelic realms. Flourite, “stone of discernment and aptitude,” stabilizes and produces order within the mental, physical, emotional, and spiritual systems, helps to provide impartiality and unbiased, detached reasoning. Garnet, “stone of health,” extracts negative energy from the chakras and transmutes this energy to its beneficial state, while bringing creative powers to the state of implementation. Goldstone, “stone of ambition,” assists in attaining one’s goals, keeping one’s emotions stable and calm, revitalizes one’s personal energy field, builds confidence, courage, a positive attitude, and promotes vitality.